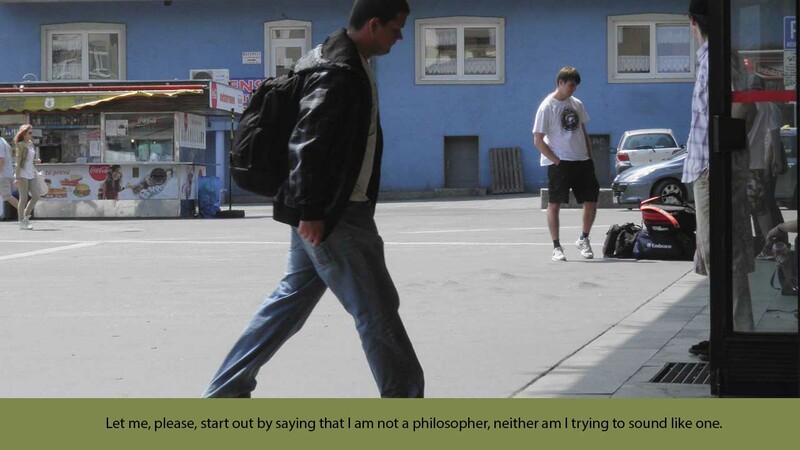 Let me, please, start out by saying that I am not a philosopher, neither am I trying to sound like one. I am only a being alive, a bold statement that is. People are alive in many different ways. That doesn’t do it. I don’t know. That being said, there is a joke I have read on the internet that I would like to share. One man (Mitch Hedberg) thinks, oh well, I have a vest; if my arms were cut off, I would have a jacket. This would certainly leave him better off during the winter as his arms would not be freezing (which is not the point of the joke to be sure). However, some people say you can feel your missing limbs; they may even ache – which raises questions about the certainty of not feeling the cold. In today’s world, many a thing is being questioned. Is that the theory of relativity spreading into all areas of, shall I say, thinking? I will put this one to rest just like an off-shoot. The theory of relativity lacks the observer, go figure. 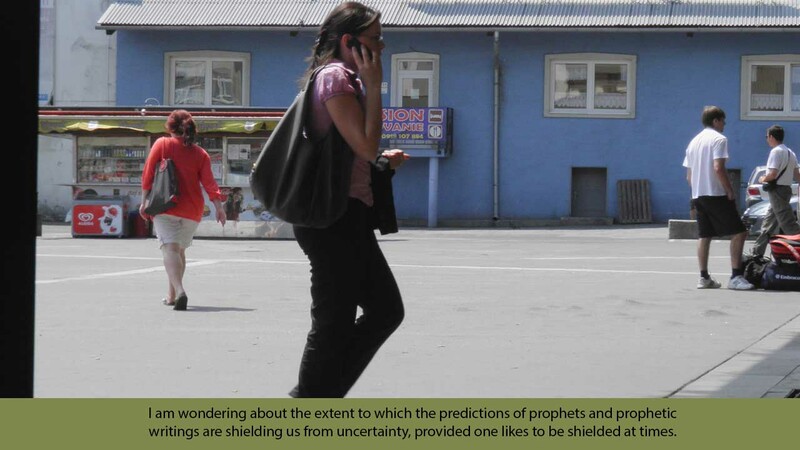 I am wondering about the extent to which the predictions of prophets and prophetic writings are shielding us from uncertainty, provided one likes to be shielded at times. If you consider the fact that Isaiah walked the streets naked for three years for others to see, he must have been pretty certain of what he was doing, who he was listening to. 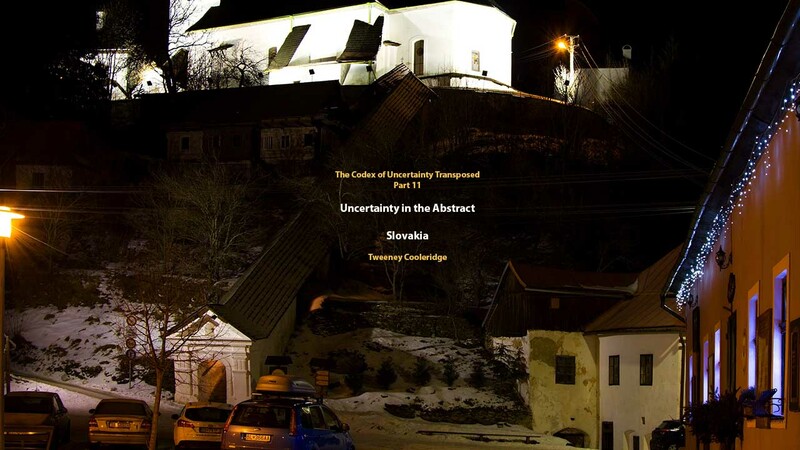 There is no uncertainty in that, is there? It’s the time that leaves us wondering. If things he talked about were to be happening any time soon – some perhaps are – we would not be at a loss. But if some are to happen thousands of years from now – no need for us to be sure about them. They become uncertain for us, as they don’t interfere with our present lifetime. 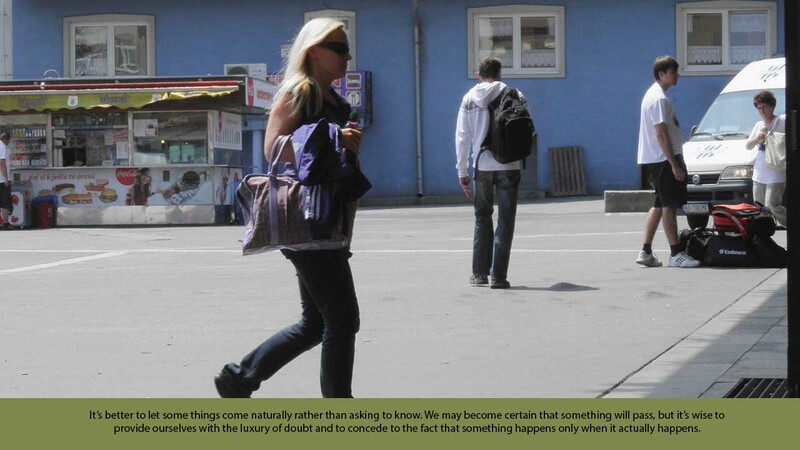 It’s better to let some things come naturally rather than asking to know. We may become certain that something will pass, but it’s wise to provide ourselves with the luxury of doubt and to concede to the fact that something happens only when it actually happens. Sometimes there is no doubt, no lingering in hope, but then being in the know makes us peaceful, especially if we “lingered” in fear. And then, even when things happen, we are not certain what their meaning is, or, different people see different meaning. 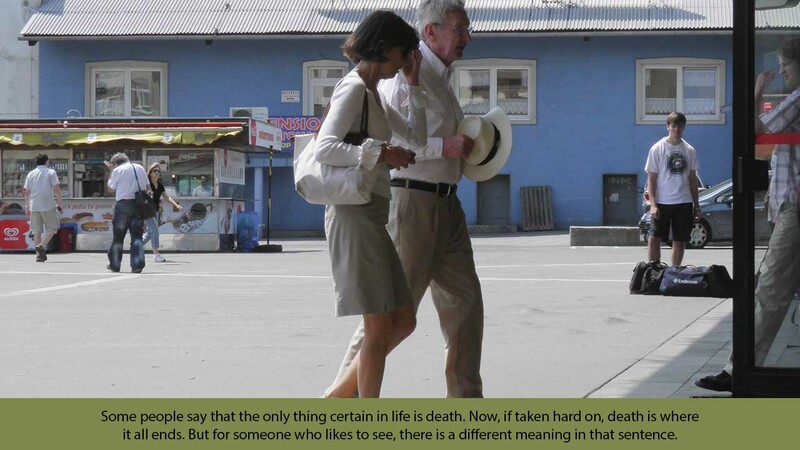 Some people say that the only thing certain in life is death. Now, if taken hard on, death is where it all ends. But for someone who likes to see, there is a different meaning in that sentence. Language offers us a whole new level of uncertainty. Sometimes we don’t know what people are really saying. The consequence of Babylon, I would argue. It’s best when one can speak to encompass all meanings so everybody can find their own truth. Things said in the wrong place, at the wrong time lose their informational value and only amount to a heap of words that become useless. It truly is a loss of information. True information is a valuable asset that helps us gain confidence and certainty. Say my name is Michael, there are many more Michaels in the world. People are able to say the word Michael in such a way that Michael knows they are or they are not talking to or about him. I would dare to say the same is with the word Devil. When the information comes through, you know what is being talked about, and feel confident. I guess no one really knows what the future holds for us. 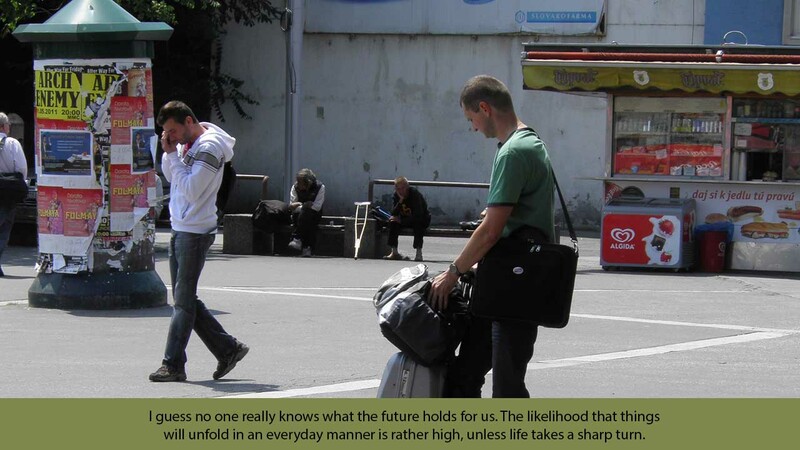 The likelihood that things will unfold in an everyday manner is rather high, unless life takes a sharp turn. Anything can happen, even though the probability of really horrific things happening is rather low. 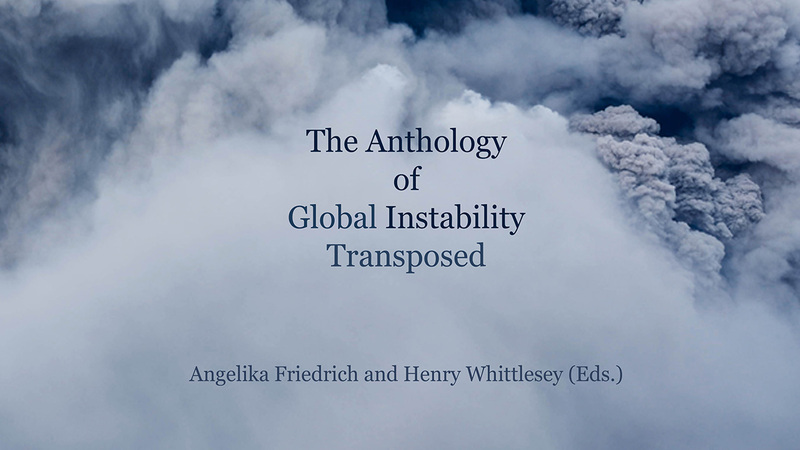 But there is this uncertainty as to the duality – horrifying as oppose to pleasurable. I am prone to think most people try to live in a manner so that bad things are kept away. But then what’s so bad about bad, that duality, good and bad. This is the greatest uncertainty in language. Bad just can be something I have seen in a store where they were selling girls’ shoes that have “bad” printed on the back of one and “girl” on the other. Perhaps there really is some duality, but we should keep away from knowing good and evil. Such duality makes our uncertainty grow into a tremendous apparition, with fear growing parallel. Justice is the cause of that. 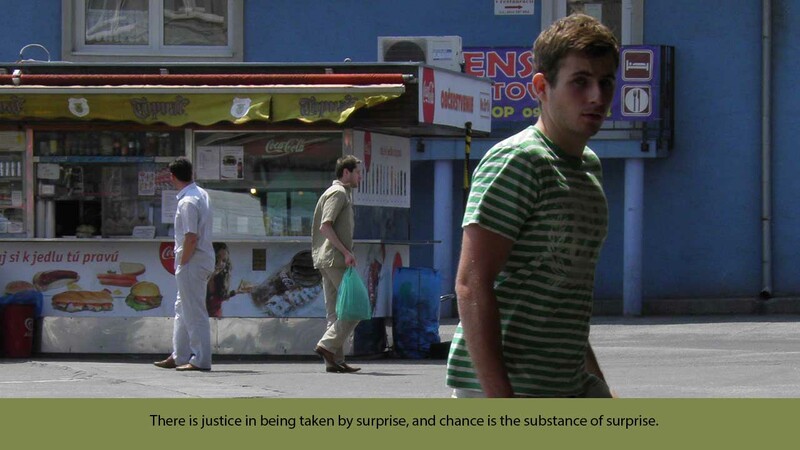 There is justice in being taken by surprise, and chance is the substance of surprise. A king caught by surprise can shake hands with a beggar. It can make the one feel like a beggar and the other like a king, with chance being a vessel of equality. We can be truly certain that justice will cause us to answer for whatever we amassed in our hearts, just as there is uncertainty to the extent that we do not know if it will bring what we expect. 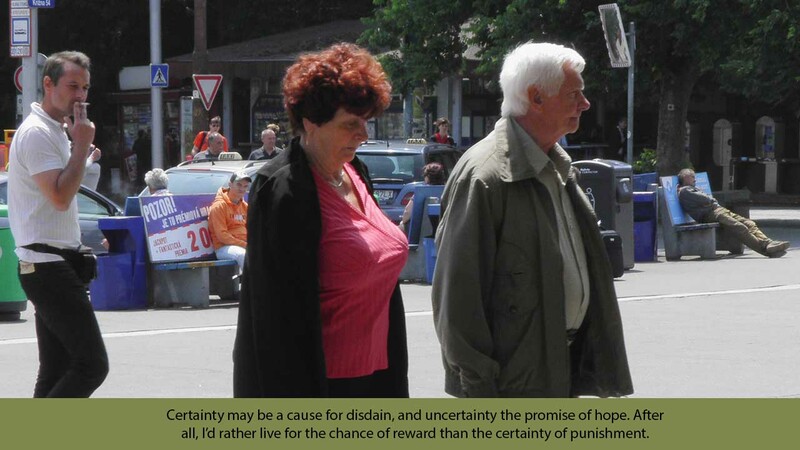 Certainty may be a cause for disdain, and uncertainty the promise of hope. After all, I’d rather live for the chance of reward than the certainty of punishment.